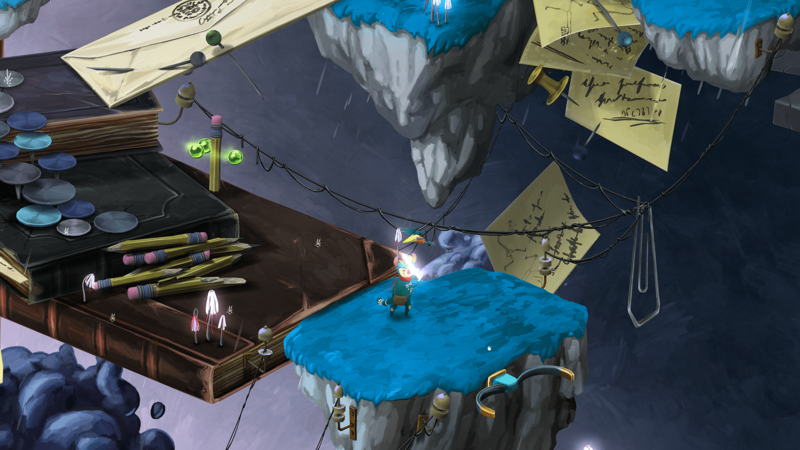 The Reticule – Hi Jonas, Figment has been out for a couple of months now on the PC, have you been busy since release? Jonas Byrresen – Yep, and doing plenty of different things as well. One thing is fixing up all the small bugs and feedback that you always get after a release. No matter how thorough of a QA process you do, there will always be some new bugs. That took priority just after release, to ensure the game works smoothly for all players. We have also spent a good deal of energy doing PR, both from home and by travelling to conventions and game shows all around. Making the game is just part of it, you also have to tell and show people it exist. This can be time consuming, especially planning for an event and the event itself will drain some energy. But it’s all worth it, since the reactions are very positive. Other than that, we are of course working on porting the game to the different consoles – something we are very excited about, but it a process that always demands some work. The Reticule – What has the reaction been like, are you pleased with how the game has performed? Jonas Byrresen – We are more than happy with the reactions and reception from both media and players. The game world and experience we have created for Figment is definitely something that stands out in positive way. People enjoy the creative use of art and music, which is very unique to the game, but also enjoy our way of approaching and dealing with the series subject of overcoming a trauma. We always knew the theme would work, and it seems players really enjoy a new way of looking at it. So, so far we are happy. We would always like for more players to try it out, but nowadays you have to think more long-term with a game’s lifetime. We see it as a good thing that games can stay ageless and still be relevant in a year or two. Most great indie titles have been that, and Figment is not exception. The Reticule – You’re working on a Switch version, along with PlayStation 4 and Xbox One releases. What challenges have you faced porting the game for the Switch? Jonas Byrresen – There will always be challenges and work when porting, no matter to what platform. We didn’t really know what to expect from the Switch, as we were told it was not that hard, but we had a hard time with the WiiU before. So far it has been going pretty well and the game is essentially running on the console right now. Now it’s a question of getting to run well at all times to create a good experience for the player. Some of the challenges have been how to handle save games, visual effects and how we compress textures. It was what we kind of expected, as the Switch is not as powerful as many gaming PCs or the other consoles. So it’s not unsolvable – it just demands some good programmers and a load of coffee. Luckily we’ve got that covered. The Reticule – With Nintendo’s platform still in the early days, but enjoying fantastic growth, do you think you will be releasing on the Switch at an ideal time to make the most of the buzz around it? Jonas Byrresen – That’s what we’re hoping. It’s a new, fast-growing market with motivated players that want some games to play, and we hope to be one of those games. But it is also because we feel Figment fits the platform very well. The aesthetics of the game work great on both the small and the big screen, and we feel the game itself fits the mentality of the Nintendo platform very well. It has a lot of players who value games with fantastical game worlds, who value aesthetics over fidelity, and who never forget the value of fun and good gameplay. Figment is made with that mentality and we hope it’s what Switch players want more of. The Reticule – The game has quite a unique concept, being a musical, but also exploring issues of the mind. What led you to making this game? Jonas Byrresen – The very first idea for the game came flying home from GDC in San Francisco some years ago. We had some award success with the early version of our first game, Back to Bed, and had been asked if we had plans to keep going in that style of game. Back to Bed took place in a dream world, so we asked ourselves “what if we went even deeper?” and ended up deciding on diving into the subconsciousness, where dreams are made. Adding to this we wanted to make something that had a deep world the player could explore, as that was what players had asked for after Back to Bed. They liked the world, and wanted to stay in it longer than a straight-up puzzle game allowed. So we decided to create a game world that can best be described as a metaphysical location that represents a human mind and then letting the player explore it via a good story. The Reticule – The music has received a lot of praise, who did the work on it? Jonas Byrresen – The big focus on music was actually not part of the original plan for the game. We always wanted good music on the game, but it was not one of the main pillars. That was until our audio designer Niels Sørensen, aka. StÖj Snak, joined the team. Niels had already worked as both sound and game designer for some years, plus doing music tours as StÖj Snak, and when we got the chance to get him on the team we jumped at it. He asked if he could do some experiments to start with, and he came up with connecting movement in the world to rhythm and letting many of the big bosses have musical pieces throughout the game. We really liked the idea of having the big central enemies in the story communicate their theme through music and song. It feels unique and can tell more than words at the same time. Having a sound designer that also has experience in game design and storytelling was a big bonus. Especially for me as the creative director, as it was so much easier to jam together and make the gameplay and story work with the audio. The Reticule – What are you most proud of about Figment? Jonas Byrresen – Hmm, that is a really hard question to ask when we are so many people that have put so much work into it, and I think people have different things they are very proud of. So I will be a bit rebellious and say the two things I am most proud of, and hope it also encompasses the rest of the team. An element in the game that many people have reacted very positively to is our approach to a very deep subject in a new and interesting way. Overcoming our fears is a key part of being human, so everyone has experienced it, but not everyone talks about it. We just approach it in an open way with a bit of humour – something that we find better than just shutting it up – and it seems to have struck a chord with many players. Also I’m very proud of many of the key events, be they puzzles or bosses, throughout the game, as they often contain both great art, music, gameplay and story, all working together without trying to push the other down. That is the strength of the gaming medium: using all other media to create something new, which just one or two alone could not create. Our thanks to Jonas for his time. We’ll be taking a closer look at Figment when it lands on the Switch. In the meantime, why not check the demo out on Steam.